Mercer commissioned the design and installation of a unique drop down ramp system at the rear of the house, probably designed for quick escapes. 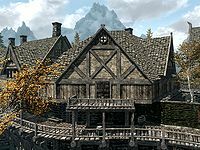 This escape provides you with a singular point of entry as the ramp can be lowered externally by firing an arrow or ranged magic at the operating mechanism under the balcony. The ramps leads to an expert-locked door which can be opened with the key found on Vald, an easily dispatched guard hired by Mercer to guard the property. Vald can be dealt with in a number of ways; see the related quest for details. The double doors in the previous room lead into a room with a long wooden table with a ruined book, an iron dagger, a bottle of wine, a food sack, a loaf of bread, cheese wheel, and a note from the engineer, identified as Kiltinius Dandoril, who completed the balcony ramp and floor mechanism. Also in the room, against the walls are: a stack of crates with a couple of food sacks on top, a set of shelves holding a medium coin purse, and two bottles of wine, a food barrel, and a tall wardrobe containing fine clothes and boots. There is also a suspicious cabinet that contains a pair of fine boots and a false back panel. The next passage has another pressure plate in the middle that triggers a poison dart trap to fire from the ceiling. Continue along the passage and on your right is a short passage that brings you to the unlocked wooden chest seen through the bars. The passage turns to the left a short distance further, as you approach swinging blades and a battering ram will start to swing across the passage. Level with the ram are alcoves on both sides of the passage, these have various crates, sacks and barrels in. Once past the blades you come to a flight of stairs leading down, and to the south. At the bottom there are bars on your left with an expert trapped door that, if tripped, fires massive amounts of poisoned darts rapidly from the ceiling, which can really do a lot of damage quickly. Jumping back is the easiest way to avoid them. 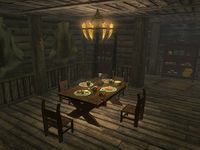 Through the door is a room that contains a wooden table and chair with Mercer's Plans, the Bust of the Gray Fox, which you can sell to Delvin Mallory as part of The Litany of Larceny Thieves Guild quest, a bowl containing various gems, a gold necklace, and a gold ring. 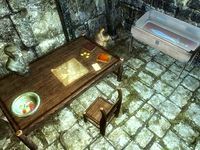 Also on the table is a copy of the Sneak skill book The Red Kitchen Reader, a copy of The Lusty Argonian Maid, v1, four loose septims, and a note from R to M (presumably M for Mercer) discussing a successful theft. To the right of the table is a burial urn and Chillrend, a unique weapon in an expert-locked display case. 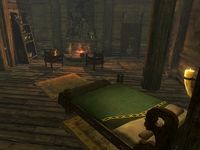 To the left of the tables is an unlocked Dwemer chest and set of shelves holding copies of The Ransom of Zarek, Of Fjori and Holgeir, Songs of the Return, Vol 56, The Real Barenziah, v5, Chance's Folly, Dwemer Inquiries Vol I, The Song of Pelinal, v4, Rising Threat, Vol. II, Antecedants of Dwemer Law, a gourd and a food sack. Esta página foi modificada pela última vez à(s) 20h01min de 15 de janeiro de 2016.